A Texas Latino GOP leader and Republican party member says that more Texas Hispanics are joining the GOP or seriously considering embracing the Republican party. Eric Garza, Vice Chair of the Latino National Republican Coalition of Texas, has been traveling throughout Texas forming new chapters of the organization. Garza says that “a large group of Hispanics are dissatisfied with or feel betrayed by the Democrat party and are increasingly joining the ranks of the GOP. In fact, after the 2010 elections, the Texas Legislature had six Hispanic Republicans as state representatives and formed the Hispanic Republican Conference with over 20 members. Now we are looking forward to the 2012 presidential election year.” Garza is impressed with the field of Republican candidates for the 2012 presidential election. 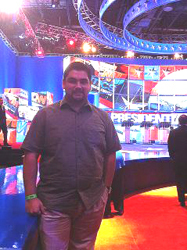 He made his comments to me after attending the Republican presidential debate on Tuesday night in Las Vegas, Nevada. Could the Republican Party and Republican candidates do a better job outreaching to Latinos? The answer is Yes!! Michele Bachman, Herman Cain and Mitt Romney used some harsh rhetoric in their comments regarding immigration. Usually Newt Gingrich and Rick Perry are more careful in this area. Damage has been done in the past by Republican candidates and Republicans in general when they talk about Latinos, and it will take a long time to capture the attention and support from voters. Garza believes Republican candidates and the Republican party should re-focus their rhetoric regarding this issue and to go ahead and have a plan to fix the underlying immigration and border security issues. However, there is a willingness among Hispanics to look and listen and decide if they will join the Republican party as the party reflects the values of Latinos. Garza said "Latinos are open to hear the decisions of people but when they hear harsh rhetoric coming from some Republicans they do not like that. It's going to get some time to gather the Latino voters and some Republican Latinos are working on it." "I do not think the Hispanic Vote is monolithic, they care about a lot of issues, not only the immigration issue. They care about jobs, the economy and education. Hispanics are socially conservative, hard working, support free enterprise and don't like entitlements. Certainly they like when candidates speak on pro-life issues and family. The Hispanic vote will be vital for next national election." A recent poll among Latinos showed that as a whole, the Republican Party still faces relatively low approval among Latino voters, as only 22% of Latino voters were likely to support the Republican presidential nominee, which is still a long way from the 40% minimum needed for the GOP candidate to re-take the White House. Eric told me that there were not too many Hispanics presents in Nevada during the Republican debate but that Robert Zavala, a Las Vegas resident who is a Republican reminded the panel that not every Latino is in the country illegally and stood up and asked the candidates "What is the message from you guys to our Latino community?" We all know that most Republicans agree on having legal immigration. What we do know is that Latinos are not happy with Barack Obama and they know Barack Obama failed his promise of fixing the immigration problem. Hispanics already have the understanding that Barack Obama is a one term president. They dislike his big spending, and they dislike his inexperienced decisions on the economy. They also dislike his liberal positions on abortion and other social issues. Whoever becomes the nominee to oppose President Barack Obama's re-election bid next year will need support from Hispanics - the largest and fastest growing U.S. minority group - to win the White House. In south Texas especially the Rio Grande Valley, Hispanic veterans feel that the local Democratic delegation has not being doing enough to secure a Veterans Affairs Full Medical Service Center. There are over 117,000 veterans in south Texas and most are predominately Hispanic. In Cameron county's last election a Republican County Judge and US Congressman were elected to office.